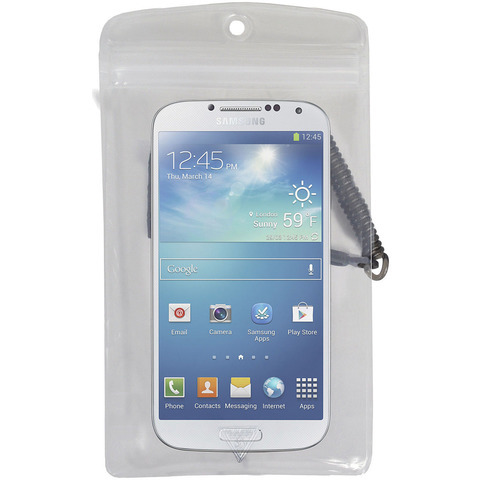 Protect your phones from the elements. Built with eco-friendly PVC-free puncture-proof film and featuring positive-snap Ziploc - style closure for secure, simple, everyday use. New wrapped-body design for maximum through-case usability. Take photos, text, call, Instagram, without missing a beat. Digi XL: New larger size to accommodate Samsung Galaxy S4 and other phablets to come. Feature Sure Grip Strap. Interior Dimensions: 6.12" x 3.62". Wt: 0.8 oz. Digi XL2: Larger size accommodates Galaxy S4 and other larger smartphones. Features PakBand Lashing System. Digi XL2: Larger size accommodation Galaxy S4 and other large smartphones. Features Pakband Lashing System.